Entertainment system including ipod adaptor. All studio classes run by TTC are FREE for peak fitness members. Off peak fitness members are able to attend studio classes run by TTC for FREE during their off peak hours. Our young members age 14+ are able to attend our studio classes run by TTC. There is a fee of £2.50 per class for tennis members. Classes for non-members are £5 per class. If you are a non-member attending for the first time, please allow 10 minutes beforehand to complete our registration process. During holiday periods (apart from Xmas) where our regular instructors are not available, classes will continue, however they may be covered by a toning and conditioning class. This does not apply to pilates, zumba and yoga. Zumba will not run on Good Friday 19th April. Pilates will start at 10.30am on Good Friday. Both Pilates, Legs, bum & tums and High intensity circuit will not run on Easter Monday 22nd April and May Day Monday 6th May. Please note that £ indicates that there is a charge for the class. Please note cardio tennis does not take place during the school half-term and full-term holidays. We also run Strength and Conditioning Classes for both juniors and adults throughout the week, please contact Tom Sanders on 07968 621274 for more information. 15 minutes strength, 15 minutes cardio and 15 minutes core. A varied class suited to all abilities. A mixture of cardio, body weight and resistance training to help you lose weight, tone and increase fitness. Involving body weight training aimed to strengthen and tone your muscles and body. A fun mixture of resistance training and High intensity training to develop fitness and aid in fat loss. Dance Aerobics is a choice of high or low impact steps put together in a fun dance routine. Relaxed atmosphere, everyone welcome. A Toning Class that shapes firms and condition the whole body with the use of free weights. Creative variations to help connect to your strength and flexibility in movement by balancing the body and mind through relaxation and breathing. An ideal session for beginners to gain a foundation in strength training, aiming to get you confident using the squat rack and resistance equipment to help you enhance your training routine. These sessions will be run in half hour slots, with two people per session, so you will be guaranteed individual attention! An all time favourite purely designed to give you those lovely legs and beautiful bums and toned tums. A great conditioning class for everyone and always light hearted. A mind and body class working on core strength, balance and posture. Ideal for stress release and improving circulation. Power Yoga is a very dynamic style of yoga, based on flowing through bodyweight routines as well as yoga stretching. It emphasises core strengthening as well as balance and strength. Be prepared to sweat! Powerhoop’s weight and wavy interior create pulsing contractions, trimming and toning your tummy and waist. New to Thongsbridge. 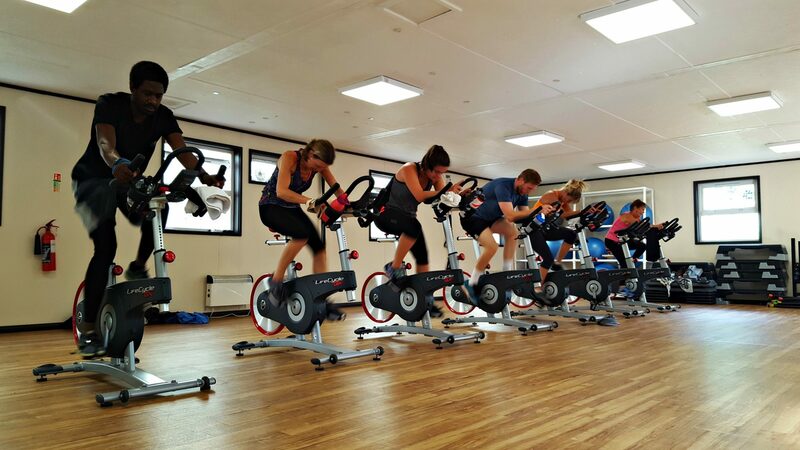 A mixture of interval training, repeated sprint training and high resistance hill climbs on our brand new spin bikes. This class is for all abilities. An aerobic based workout with the aid of a step and light hand weights,combining muscle conditioning exercises. Easy to follow, come and join in! A fun class offering a variety of movement whilst working the body aerobically. Developing coordination, balance, power and strength. Suitable for all levels of fitness. TRX is a type of training that uses your own bodyweight and gravity, to build strength,balance, coordination, flexibility, core and joint stability, all while avoiding injury. Join this popular dance craze, latino and international inspired dance. A fun class for all levels! Why not enjoy exercising?